Thank you to Andrew Goldson for sending this image of him with a 11.6lb fish taken on 8th September from Upper North Walk on his yearly fishing trip with Dad Tony. 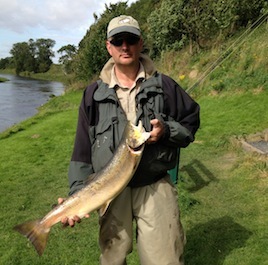 This entry was posted in Uncategorized and tagged Angling, boatmen, fish, fishing, fishing trip, FishTweed, River Tweed, salmon, Tweed, Tweed Valley, Upper North Wark. Bookmark the permalink.